This spot was once the scene of a tremendous clash of forces. Rushing water smashed into the rock formations you see around you and formed this gorge. What could create such a mighty torrent of water? About 10,000 years ago, a warming climate caused continental ice sheets to melt. 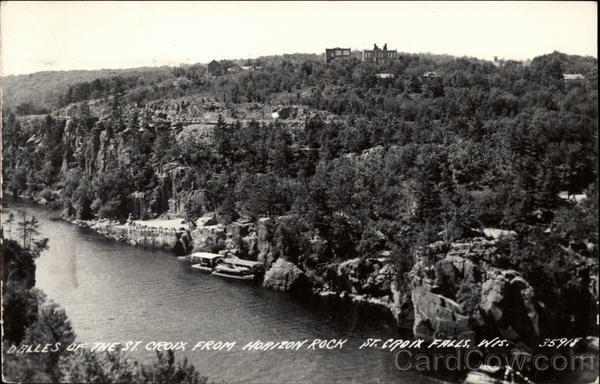 The meltwaters formed Glacial Lake Duluth. Enormous quantities of water drained in torrents down an outlet that would become the St. Croix River. The charging waters collided with ancient volcanic rock that stood here. Blocks of this rock formation, weakened by angular fractures, broke away under the water pressure. 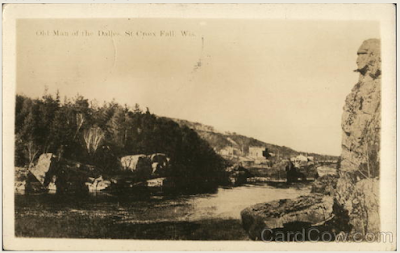 This action created the steep-walled gorge in front of you -- the Dalles of the St. Croix. Stand in the overlook and look to your right. Do you see the outline of the face in the "Old Man of the Dalles" formation? Old Man of the Dalles, St. Croix Falls, Wis. Looking south at the St. Croix River. Can you see the girl sitting on the top / edge of the bluff. A treacherous climb over the rocks to get to the marker. The steps leading down to the marker. More steep steps . . . The steps are almost as high as Dexter. 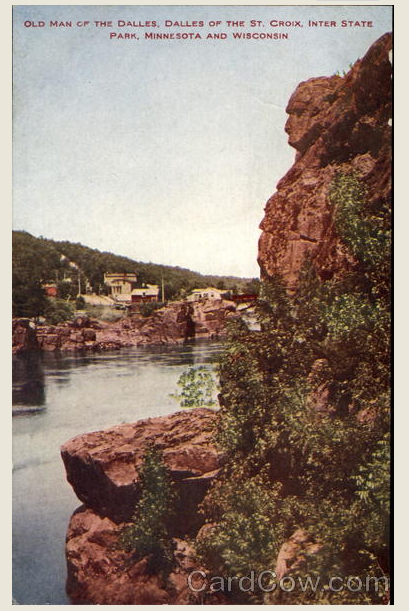 The marker is along the St. Croix River. The marker is on the Pothole Trail.